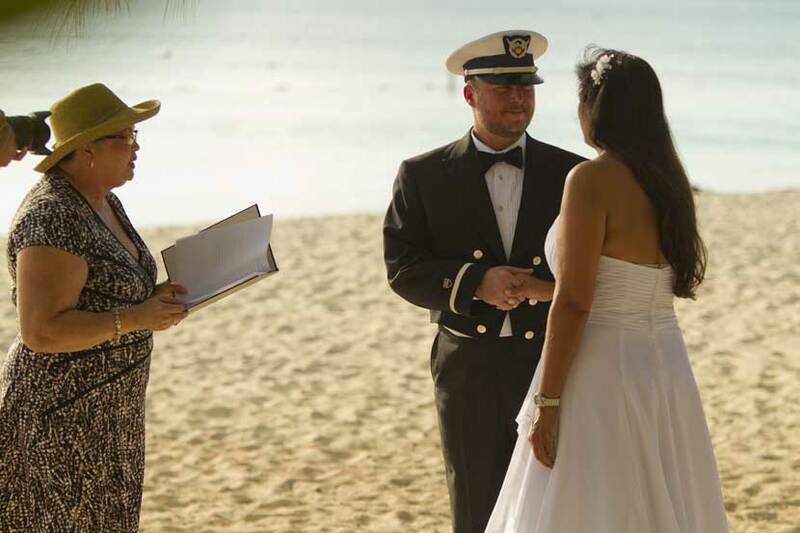 We get a lot of emails from couples wanting a very simple, Cayman wedding. Many of these arrive on cruise ship, but recently we have been getting a lot of stay-over visitors as well, as this North Carolina couple below. These are the kinds of questions I get most often. What do I have to provide in advance? - Copies of the picture page of both passports, any divorce decrees, or death certificates as application, and an application form. We also require a deposit of $250 to reserve your date and time. Can Simply Weddings pick us up? Yes, many of our wedding packages provide transfers, from the harbour to our office and Bridal Room, to the beach for the ceremony, and back to the harbour. How do we choose the beach wedding location? 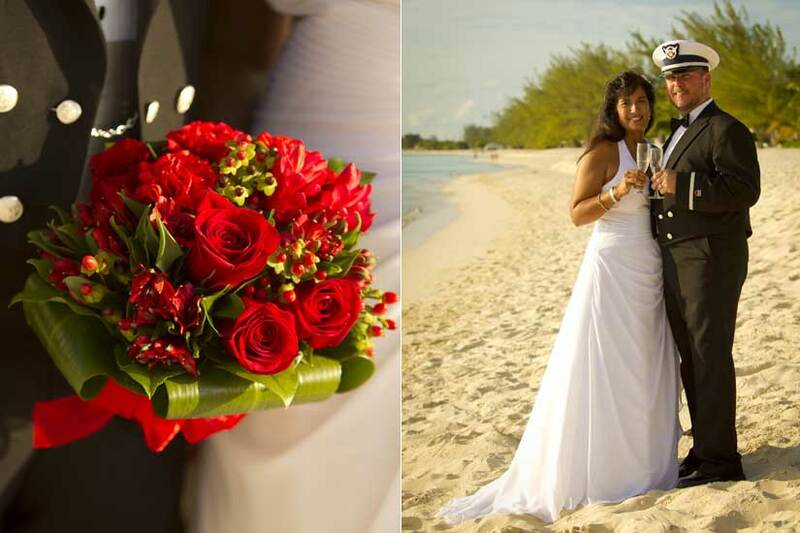 Have a look at my Facebook pages, SimplyWeddingsCayman and GrandCaymanBeachWeddings in my Photo Albums you will see many beach locations. I would like some flowers, do you provide them? Of course, many of our packages have bridal flowers, or we can customise a special order bouquet for you. I would like a few photos of my wedding, can you provide them? We have one photo package, which is done by a professional photographer and you receive edited high resolution and low resolution (for emailing) images on a CD. We no longer provide prints in an album. We also provide videography as required. You are welcome to take pictures with your own camera. Can you guarantee we will have privacy for our wedding? Not on Seven Mile Beach. This whole strip of beach is public, but I can take you to a quiet beach you will be unlikely to have other people in your pictures. We would like our children/our family to be included in our wedding ceremony, is this possible? Of course, I write many ceremonies to include special requests. You can also create a Family Memory Vase using a Unity Sand Ceremony. 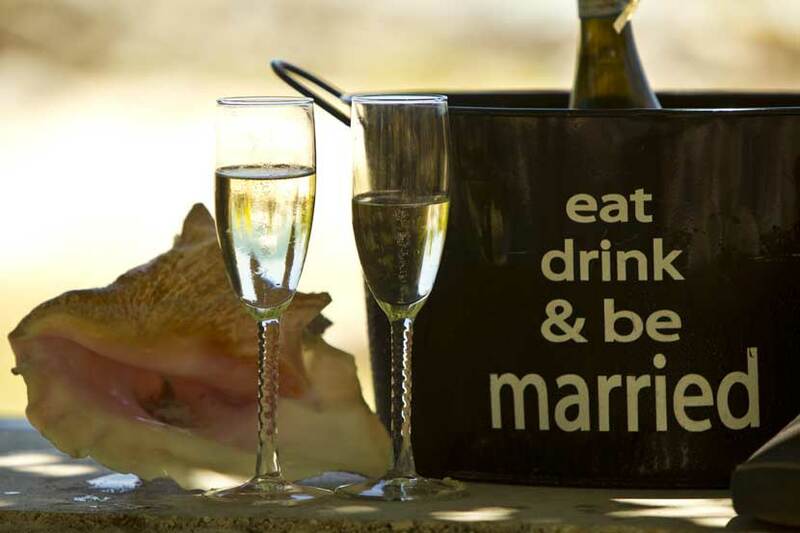 Are there any Cayman Islands traditions which you include? Definitely, I like to use the "Champagne and Cork" ceremony, and if there are children present I will have a gift for them to remember the day.